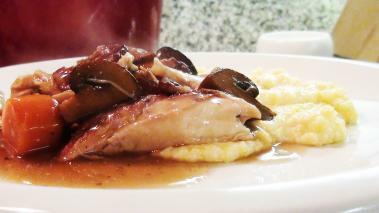 Coq Au Vin sounds pretty intimidating, until you realized it’s just Chicken In Wine…how hard that can be? I’ll tell ya, it’s not hard at all, but it tastes so yummy and complex, you’ll be completely blown away! Traditionally, coq au vin was made with old, tough chickens (that couldn’t lay eggs anymore) that needed to be braised a long time to make them tender. These days, the chickens aren’t so old, but that long slow cooking still gives a ton of rich flavors that you can only get with time…and of course love! It’s a one pot wonder that I love during the cooler months of Fall and Winter, but frankly, I’ll make it whenever the mood strikes me. Hope you enjoy it as much as I do! Like most braises, you really want to brown the meat in the pan before adding the other ingredients. That will render out the fat on the skin, as well as provide a much deeper, richer flavor for the stew. Use good stock. Like the wine, it contributes quite a bit of flavor to the dish. Ideally, it’s homemade, but a good quality store brand is great too. I would serve whatever it is I used for the braising liquid...for me, that's a Burgundy!